Agendas for upcoming City Council meetings are generally released on Thursday afternoons. I like to take a look to see what Council will be discussing, and I figured I should share that here. Below you’ll find links to the meetings taking place next week, as well as links to and thoughts on some agenda items that caught my eye. You can find my previous roundups here. The net residential density of the proposed ASP has increased from 30.6 to 34.0 dwelling units per hectare. An increase in the Business Employment designation is not being proposed as it would increase infrastructure costs, among other considerations. Administration says this can be further refined during the NSP phase. This bylaw is ready for second reading only – third reading is being withheld pending review by the Capital Region Board. Action 14: Create more and better opportunities for Garage and Garden Suites in established neighbourhoods by amending the Zoning Bylaw’s location criteria and Site regulations for these types of housing. There are currently restrictions on where Garage and Garden Suites can be located, on the height of those structures, and on the minimum site area. The proposed amendment addresses all of these restrictions. The second proposed amendment will allow a minimum site width for single detached housing of 7.6 meters, decreases the minimum site area for single detached housing to 250.8 m2, increases allowable site coverage for narrow lot developments to 42%, and allows the subdivision of a lot zoned RF1 to a maximum of two lots. This bylaw is to rezone the property located at 660 Allard Boulevard SW from AP to US to accommodate the development of a public elementary school. This is being done “in conformance with the Heritage Valley Servicing Concept Design Brief and the Allard Neighbourhood Area Structure Plan.” No concerns or questions were raised as a result of the advance notice. Apparently the station is built over several lots and road right-of-way created by “Plan Q” way back in 1893. Bylaw 17111 is to allow a freestanding sign to be put up at 5315 127 Street NW to identify the new Eco Station. Bylaws 17070 and 17071 will be considered together, and amend the Maple NSP to designate land that was being used for a cell tower to row housing as the tower has been dismantled and is no longer in operation. Bylaw 17133 is an amendment to the zoning bylaw to reduce the required minimum Side Setback for garages in RF4 zoned areas from 0.9 meters to 0.6 meters, “specific to Garages where the vehicle doors face a Lane abutting the Site.” Currently constructing a detached garage for each unit of a semi-detached house would require a Class B discretionary development approval. Next up for Council is a regular City Council Meeting scheduled to take place on Tuesday and Wednesday. There are 14 public reports, 3 bylaws, and 3 private reports on the agenda. AUMA’s Executive Committee will be making its annual presentation to Council’s Executive Committee on March 24. The Chair and CEO of the Capital Region Board will also be presenting to Executive Committee on March 24. The CRB’s Regional Services Committee may be disbanded pending a report in August 2015. The Federation of Canadian Municipalities (FCM) will hold its annual conference in Edmonton from June 5-8. The mayor will host a reception in Churchill Square after the opening game of the FIFA Women’s World Cup on June 6. Edmonton will be the host city for the 2019 International Council on Alcohol, Drugs & Traffic Safety (ICADTS). The 7th Traffic Safety Conference takes place here in Edmonton from April 27-30. This report presents a draft of the strategy and will be discussed in a facilitated session on Wednesday morning. So what is a Community Energy Transition Strategy? An Eight-Year Action Plan establishing the first step (2014-2017) and signaling the second step (2018-2021) of Edmonton’s energy transition journey. To say there’s a lot to digest here would be an understatement. There are 11 strategic actions, 7 opportunity areas, 45 focus areas, and 10 community scale programs. Targets include reducing greenhouse gas emissions by 35% by 2035 (compared to 2005 levels), reducing energy consumption by 25% per person by 2035 (compared to 2009 levels), and generating 10% of Edmonton’s energy locally by 2035. By 2035, Edmonton’s Community Energy Transition Strategy is “expected to deliver a net present value of approximately $2.5 billion to citizens and community stakeholders.” The report argues that a City Policy is important to make this happen. The report isn’t available yet, but Council will be discussing how to advocate for funds for future LRT development. This item came up at the Transportation Services Committee back on February 25. As a reminder, there is roughly 32 km of the 69.7 km LRT Network Plan without funding. Exemption from LEED Silver for Varscona Theatre – That the exemption to City Policy C532 be approved. Impact of the Alberta Wetlands Policy on City Wetlands – That the Mayor, on behalf of City Council, write a letter to the Province outlining the concerns expressed regarding the Alberta Wetlands Policy implementation. Request for Retroactive Municipal Tax Refunds – That the refunds totaling $73,061.48 including any associated penalties be refunded. ETS Fare Policy Revision for U-Pass – That the policy be replaced as outlined at this week’s Transportation Services Committee meeting. Bylaw 17005 is an amendment to the Procedures and Committees Bylaw 12300 to change the time for continuation of City Council meetings and Public Hearings. Currently they continue the next business day, but the amendment would allow Council to choose a time within the next three business days. Bylaw 17128 is to decrease the borrowing authority by $9.6 million to $12.3 million for the Aurum Energy Park. This is required to enable the City to recover the actual cost of the local improvement rather than the estimated cost. Bylaw 17101 increases borrowing for sidewalk reconstruction in the Hazeldean neighbourhood by $8,339 because the originally assessed area was short by 46 meters. This is a very small chunk of the $6.9 million project cost. Council will receive three private reports: one is an intergovernmental update on the City Charter, and the other two deal with the performance evaluations for the City Manager and City Auditor. The 2014 performance evaluation results are time-specific at 1:30pm on Tuesday. Another Community Services Committee meeting has been scheduled for Thursday morning, to allow Council to continue interviewing applicants for the Civic Agencies Recruitment effort. 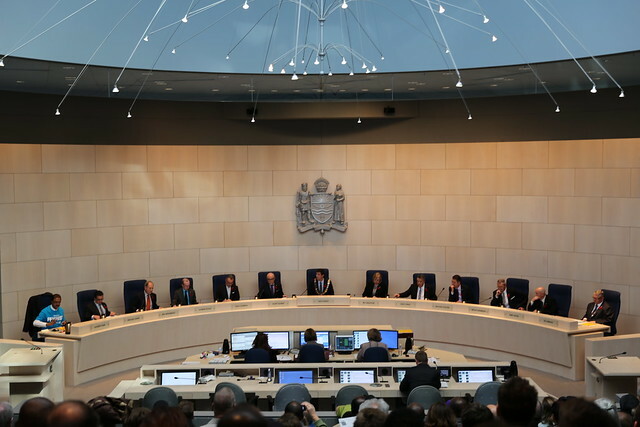 You can keep track of City Council on Twitter using the #yegcc hashtag, and you can listen to or watch any Council meeting live online. You can read my previous coverage of the 2013-2017 City Council here.